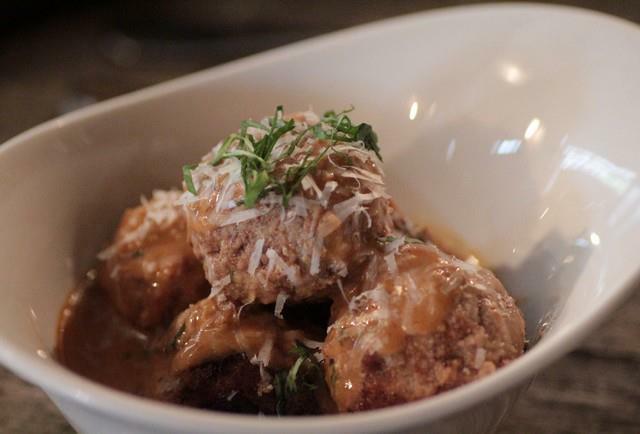 Run, don’t walk, to The Meatball Factory, which will celebrate their grand opening tomorrow, Tuesday October 25. Serving up a variety of meatballs, sauces, crispy pizzas, pastas, and fries, this new meat-centric spot will soon become your favorite comfort food found on 14th street. Each flavorful menu item is also affordable - with nothing priced over $15! Relax in this cozy, brick walled restaurant, with wide windows opening out to the hustle and bustle of the ever-trendy East Village. When ordering from “The Meatball Gallery”, choose the type of meat (or go meatless if being a vegetarian is your thing), then pick your favorite sauce. ‘Lambda, Lambda, Lambda’ (Elysian Farms leg of lamb & shoulder, oregano & pecorino romano) is perfected when matched with ‘Shroom Central’ (roasted medley of wild mushrooms blended with veggie stock, thyme and a touch of cream). For something truly special, order ‘Turducken’ (house blend of La Frieda Turkey, Bell & Evans chicken, Hudson Valley Farms duck confit, sage & allspice) smothered in ‘Truffle Time’ (The Black Truffle Sauce from Dave’s World Famous Black Truffle Mac ‘n’ Cheese - slow cooked cream, shallots, brandy, sherry, truffles, fontina, thyme & oregano). Make sure to order a Crispy Crackerbread Pizza (or two) for sharing. Each thinly crusted pizza is served with grated parmesan, crushed red peppers and fiery agave. ‘Shrooming (roasted wild mushrooms, baby arugula & Truffle Time cream sauce) will make your truffle-loving high class friends happy. The standout pizza is the ‘Thai This’ (green curry peanut sauce, Turducken meatballs, Thai Chiles and Grana Padano) for a sweet peanut taste with a spicy kick in the mouth. For the ultimate hangover cure (or for a heavy meal to satisfy your hungry dad or boyfriend) The Meatball Factory offers fresh cut Idaho fries coated in cheese and sauce, known as ‘Poutine’. Add on your favorite meatballs to top it all off for only $10. For a suggested flavor match-up, order Hells Bells Vodka Sauce (Absolut Peppar, spicy cappicola, red bells, San Marzano tomatoes, oregano & cream) with Latin Stallion Meatballs (spicy El Cerdito chorizo, buffalo, Heritage pork, manchego, adobo & potato). This piling heap of heaven will be topped off with queso, covering the crispy fries. 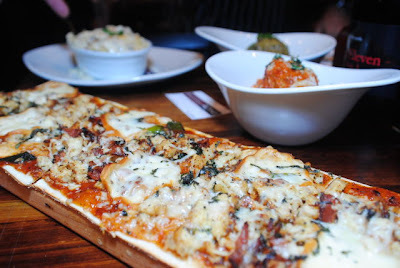 The vibrant and talented Chef Dave Martin has included his well-known dishes with an array of new flavors and specialties to The Meatball Factory menu. Are you on a special diet requiring dairy-free, gluten-free options? Or do you suffer from food allergies? No worries, as Chef Dave has got you covered, keeping your diet and allergy needs in check with alterations and variations available throughout the offerings. Check out the menu! Visit The Meatball Factory with meat-lovers and vegans alike, as this menu of comfort food will satisfy everyone this fall! The Meatball Factory. 231 Second Avenue. Can't wait to try it the next time I'm in the EV! When Not to Say "I Love You"